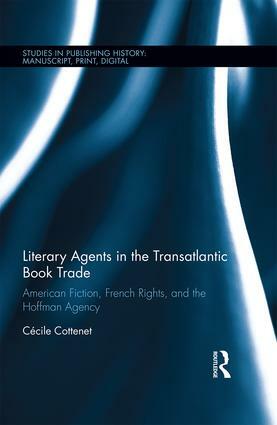 By way of a case study of one of the oldest French book agencies, Agence Hoffman, this book analyzes the role played by French literary agents in the importation of US fiction and literature into France in the years following World War II. It sheds light on the material conditions of the circulation of texts across the Atlantic between 1944 and 1955, exploring the fine mechanisms of agents’ negotiations which allowed texts, and ideas, to cross borders. While providing comparative insights into the history of publishing in France and in the United States in the immediate aftermath of the war, this book aims at foregrounding the role of the book agent, an all-too often neglected intermediary in the field of book history. Grounded in archival work conducted both in France and the United States, this study is based on previously unexamined correspondence. Considering the concept of mediation as central in the field of print culture, this book addresses the dearth of scholarship on literary agents on both sides of the Atlantic, and intersects with the current scholarship on transatlantic, internationalm and transnational cultural and trade networks, as evidenced by the recently emerged field of sociology of translation in Europe. Cécile Cottenet is Associate Professor in American Studies at Aix-Marseille Université, France.